Defendant's motion for summary judgment of invalidity was granted. Under In re Bilski, 545 F.3d 943 (Fed. Cir. 2008) (en banc), the court found that the patent failed to claim patentable subject matter. "Simply because the process at issue requires machines or computers to work . . . does not mean that the process or system is a machine. . . . In the process claimed by the [patent-in-suit], a mathematical algorithm uses machines for data input and data output and to perform the required calculations. Those machines do not, however, impose any limit on the process itself. The involvement of the machine in the process is insignificant extra-solution activity and thus the process is not patentable under § 101." The court's determination of inequitable conduct during the inventorship portion of a bifurcated trial, "based on the court’s finding that signatures of [a] co-inventor . . . [were] forged," did not violate defendant's due process rights. "The court gave both sides ample opportunity to brief the issue and present oral arguments, and the court also deemed the pleadings to have been amended to correspond to the evidence presented at trial. The court cannot ignore the glaring evidence of both materiality and intent and set aside its finding of inequitable conduct simply because of the unusual procedural circumstances in which the underlying facts came to light." Defendant's compliance with the FDA's labeling requirements, after unsuccessfully proposing alternate labeling options, established defendant's intent to induce infringement and warranted entry of a preliminary injunction. "[Defendant] was aware of and certainly concerned about the potential infringement problem posed by its label such that it attempted to cure the problem by proposing labeling alternatives to the FDA. . . . When the FDA unsurprisingly rejected these proposals, [defendant] decided to press forward with its label anyway. [Defendant] did so despite the fact that the label contained language that [it] knew to be problematic and, by its own conduct, attempted to remedy, albeit unsuccessfully. In this Court’s view, this conduct shows an intent to induce infringement." Plaintiff's motion in limine was granted in part. "The parties are precluded from making any reference to 'patent trolls;' however, the defendants may show the type of business in which the plaintiff is engaged." "It cannot be said that Federal Circuit precedent establishes that every single claim limitation must be identified in the prior art for a court to invalidate a patent claim on the basis of obviousness. Nor is it apparent that, even if there had been such a rule, [KSR Int’l Co. v. Teleflex Inc., 550 U.S. 398, 406 (2007)] left it untouched. That unanimous Supreme Court decision dealt specifically with the teaching-suggestion-motivation test, but its reach was not explicitly limited to that issue; rather, the opinion set out principles implicating the nonobviousness analysis more generally. . . . This court can discern no rigid 'each and every limitation' rule in either the statutory language of section 103 or the flexible test set forth by the Supreme Court in Graham and reaffirmed in KSR. Accordingly, the fact that the final limitation of the [asserted patents] is not disclosed in any piece of prior art here in evidence does not mean that the claim necessarily meets the requirement of non-obviousness." The court reduced plaintiff's claimed costs for copying and bates stamping from $46,427 to $1,327 because of insufficient documentation. "[Defendant] need not individually identify each copy made, but it provided absolutely no explanation to the court of why these copies were necessary. The court cannot even identify the purpose of some of these charges, much less determine necessity, from the papers submitted." Following a bench trial finding of inequitable conduct, plaintiff's motion for a new bench trial was denied. The court rejected plaintiff's argument that a new trial was warranted because of "a patent examiner's recent decision to allow a similar application even after learning of the same prior art. [T]his decision does not provide convincing evidence to refute the court's prior conclusion that [plaintiff] knowingly withheld material prior art." Plaintiffs' motion for a finding of exceptional case and an award of attorneys' fees for $13.3 million was denied. "Reviewing the entire record, including discovery spanning five years, [defendant] did employ some marginally vexatious litigation tactics. However, as Magistrate Judge Peebles noted, discovery was 'contentious and hard fought' by both sides. At the close of discovery, he concluded that 'the playing field has been leveled' when he denied [plaintiff's] request for sanctions. . . . Litigation by its nature is adversarial. Clients seek, and, in fact, deserve zealous advocacy. [T]his court finds that actions of [defendant's] counsel did not stretch beyond the bounds of civility. This court holds all counsel involved in this litigation in high regard with respect to their advocacy and timely assistance to the court. Moreover, the parties did not violate the court’s orders during trial." Alleged "assurances [by plaintiff] made to [defendant] during negotiation of [a license agreement] that [defendant] would have a competitive advantage over those who chose to litigate with [plaintiff], by fulfilling its obligations under the [license agreement]" did not equitably estop plaintiff from seeking infringement damages beyond the royalties payable under the license. "In California . . . under the parol evidence rule, evidence of prior or contemporaneous agreements or understandings between the contract negotiators cannot be used to 'add to, detract from, or vary the terms' of the parties' written agreement. . . . To the extent [defendant] purports to have relied upon its own interpretation of [a section of the license agreement] based on extra-contractual statements made by [plaintiff's] negotiators that were not incorporated into the terms of the [license agreement], such reliance was inherently unreasonable." The magistrate judge recommended finding an exceptional case and granting attorneys's fees where "[plaintiff] brought this lawsuit for infringement based on a patent received without full disclosure to the PTO and engaged in a strategy of vexatious litigation, aimed at thwarting discovery of its inequitable conduct, finally choosing to dismiss the case before any adverse rulings." The district judge adopted the recommendation, observing: "The inference is inescapable that the misguided efforts by [plaintiff's] counsel to resist discovery on inequitable conduct arose in significant part because it was members of that firm that had engaged in such conduct. Under the circumstances, this case played out quite predictably." Plaintiff could not establish a fact issue as to whether plaintiff's infringement was willful absent evidence relating to a specific claim. "Although the 'objective' factors [plaintiff] cites attempt to show the existence of an 'objectively high likelihood,' they say nothing about any specific claim. At most, these factors show that there is some likelihood that [defendant] infringes some valid claim among [plaintiff's] vast portfolio. This Court rejects this collective notion of willfulness. To prove willfulness [plaintiff] must show recklessness with respect to specific claims." In granting in part defendants' motion to compel fee agreements between plaintiff and its counsel, the court noted that "[t]here may be circumstances in which a contingency fee agreement would be a single fact out of many used to prove deceptive intent for the purposes of inequitable conduct. While Defendants have failed to outline or assert any basis for such a showing, evidence need not be admissible at trial to be discoverable. Moreover, relevance does not require sufficiency as to the claim at issue. As a result, the Court is unable to conclude that the non-privileged information is not discoverable." "What sum of money, if paid now in cash, would fairly and reasonably compensate Plaintiffs for their loss, if any, resulting from the negligence for which you have answered "Yes" in Question No. 7? . . . This question inquires only into the amount of money in gross, exclusive of interest, that Plaintiffs would have been awarded against the SCBA manufacturers had Plaintiffs prevailed in the infringement litigation. Answer in Dollars and cents, for damages, if any. 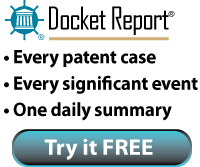 In granting defendants' motion to stay pending reexamination, the court noted that "[plaintiff] has not pointed to any separate business interests that might be jeopardized by a delay pending reexamination. . . . [Defendant] asserts that [plaintiff] is nothing more than a patent holding company. While it is true that the complaint alleges that [defendant] is still marketing the alleged infringing product, [plaintiff] can always move to recover damages for such sales at the end of the litigation if [plaintiff] is successful on its claims." Plaintiff was entitled to summary judgment as to defendant's equitable estoppel defense. "[Defendant] repeatedly suggests that [plaintiff's] conduct is misleading based on what [defendant] 'could have' inferred from [plaintiff's] overtures. But [defendant's] argument focuses on the wrong question. The issue is not what [defendant] could have believed, but whether [plaintiff's] conduct was somehow misleading. Here, there was nothing misleading about [plaintiff's] actions. . . . "With respect to the reliance element, [defendant] repeatedly suggests that it 'could have' believed that [plaintiff] would not file suit against [defendant], but [defendant] never says it actually had this belief. [Defendant] fails to submit any declarations, cite to any deposition testimony or identify any other evidence that shows that [defendant] actually believed that [plaintiff] would not pursue [defendant]. Instead, [defendant] simply argues that it could have avoided expenditures if [plaintiff] had brought suit earlier. This shows harm, not reliance." Intervening Rights is a Required Element of Prosecution Laches, Not Merely "One of Many Factors to Consider in the Totality of Circumstances"
In granting plaintiff's motion for summary judgment as to defendant's prosecution laches defense, the court rejected defendant's argument that "other courts have held that 'intervening adverse rights' is merely one of many factors to consider in the totality of circumstances determination." "[T]his Court concludes that [plaintiff] is correct and that the Supreme Court has addressed the issue of intervening rights. In both Crown Cork [& Seal Co. v. Ferdinand Gutmann Co., 304 U.S. 159, 167-68 (1938)] and General Talking Pictures [Corp. v. Western Electric Co., 304 U.S. 175, 183 (1938)], the Supreme Court held that prosecution laches would not apply absent intervening adverse rights. . . . Although the precedent is old, it is controlling. Therefore, this Court likewise finds that to prevail on a defense of prosecution laches, the defendant must prove both: 1) unreasonable and unexplained delay, and 2) intervening adverse rights." Even Under KSR, Party Asserting Obviousness Defense Based on a Combination of Prior Art References Must Provide Some Evidence of a "Reason to Combine"
Defendant was not entitled to summary judgment of invalidity based on a combination of prior art references. "[Defendant] argues that 'one of ordinary skill in the art would have been motivated to combine these references to address the problem stated in the application . . . however, [defendant] has failed to present any evidence in support of this assertion, nor has [defendant] presented any evidence suggesting the above-referenced 'problem' was 'known' in the field at the time of the application for the patents-in-suit. Consequently, [defendant] has failed to demonstrate a reason to combine the references at issue existed." Plaintiff's motion for enhanced damages was denied. "[Defendant's] initiation of the reexamination proceeding was not egregious. The reexamination proceeding did not delay the court proceedings, and in fact helped to focus the issues for trial by clarifying the distinctions between prior art and the claimed invention. The fact that [defendant's] positions on claim construction evolved during the course of the litigation is not a factor that weighs in favor of enhanced damages. A party is entitled to clarify its claims and defenses and the evidence supporting them as litigation unfolds." "[T]he . . . question posed by the Federal Circuit’s decision in Muniauction [Inc. v. Thomson Corp., 532 F.3d 1318 (Fed. Cir 2008)] is the following: is vicarious liability a necessary condition to satisfy BMC Resources [Inc. v. Paymentech, L.P., 498 F.3d 1373 (Fed. Cir. 2007)]’ control or direction standard . . . or is it merely a condition sufficient to find infringement within the spectrum of possible interactions ranging from an armslength agreement to 'contracting out steps of a patented process to another entity?' I conclude that the court intended the latter. . . . Were vicarious liability a requirement for a finding of joint infringement, then an entity could use a patented method with impunity by hiring an independent contractor to perform one or more steps of that method. . . . While a showing of vicarious liability is sufficient to find direction or control, it is not a necessary requirement." Akamai Technologies, Inc. v. Limelight Networks, Inc. Defendants' motion to stay pending reexamination was denied. "The Court is not fully convinced that reexamination will simplify the issues for trial in this case. Based on the PTO’s most recent report, ex parte reexaminations result in all claims being cancelled only 11% of the time, and they result in some claims being changed 64% of the time. While either of these outcomes could simplify some issues in this case, it is difficult to gauge, at this early stage in the reexamination process, how likely it is that any of the patent claims at issue will ultimately be cancelled or modified through amendment. . . . One final reason why reexamination is unlikely to simplify the issues in this case is that the Defendants may still challenge the validity of the patents at issue because ex parte reexamination proceedings have no estoppel effect."